Did a fun interview with one of my favorite partners, Postable, where you can order and send my cards directly through them! This interview published with a Beyoncé gif so it's definitely one of my favorite interviews I've done in a long time. Had a conversation with the NYPL just in time to launch our window. 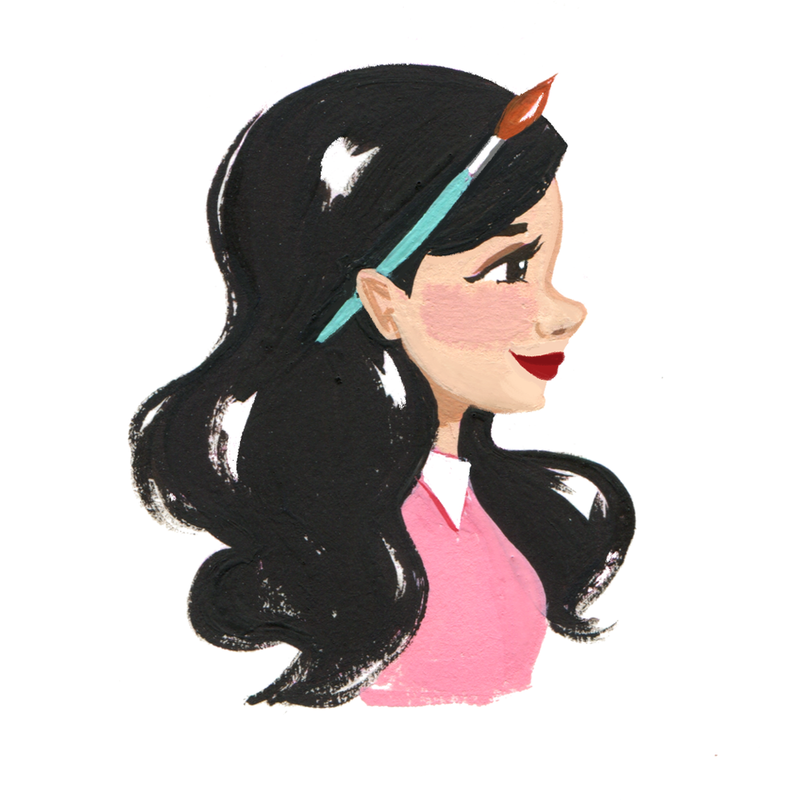 Sharing art and advice with DisneyStyle. This one's for your listening pleasure – I did this podcast interview (who's not obsessed with podcasts right now) with Tiffany Han last fall and forgot to post about it! We chatted for so long that there are actually two parts. Start here, and part two here. I am so honored to be featured on Forbes.com today. I'm so grateful that it came out today, which also marks the second anniversary of the day I left my job at Mattel to strike it out on my own. Writer and visionary Cate Scott Campbell asked really great questions and it was a pleasure to go deep with her on how I got here. If there's one thing I really want you to take away from this, it's that you've gotta believe in yourself. It's a lesson I've had to learn the hard way, after sorting through years of self-doubt, academic guidelines, societal standards, difficult work situations, and giving too much weight to other people's words. There have been many times that I was lucky enough to have people around me who believed in me more than I did at the time. I'm also grateful for all the challenges I've experienced, because it's taught me that no one knows what they're doing. So if you're gonna have faith in someone – it better be yourself. And if you're not there yet, if you're not the person you feel like you can count on yet – put in the hours and work on it until you are. Today I'm sharing my pursuit for good mental health while being a self-employed creative – something that is much easier said than done. When I first started working for myself full time, I was super pumped. I was also jumping from client project to client project, starting an endless number of personal projects, redesigning my website, migrating my blog, along with invoicing, reviewing contracts, having client meetings, negotiating, and other miscellaneous admin work. I just wanted to work, and I jumped in head first and I totally loved it. Then it started to wear me down. I started having more existential moments of "what-is-it-all-for" and "what-am-i-doing-with-my-life". Have you ever noticed that there are thousands of books, articles, and podcasts about how to quit your day job and follow your dreams? There's not so many about what happens when your dreams become reality, and how to handle life after the leap. Jumping in full steam, like I had been doing to get this career started, wasn't going to be sustainable as a business in the long run. One of my favorite tools has been Todd Henry's Accidental Creative podcast. His podcast on the importance of a morning routine has been one of my favorites that I keep referring back to over and over. 10 minutes of planning my day/writing lists/to-do lists/goals/etc. I try to do this all before even checking my phone for email or Instagram updates (this is very hard). I find that on days when I can fit in the whole routine, I feel calmer and more productive for the rest of the day. A big change I made in the last couple weeks was my to-do list. I'm a pretty organized creature of habit, and I really love making lists. So I usually make a daily to-do list in my planner, and then struggle with getting it all done and referring to the list each day. Turns out, these lists are a bit unreasonable because I'm just writing down everything I want to do and not taking into account how much time I actually have to do everything. At first I tried using Jessica Hische's Ultra Schedule as a new model for my unstructured days, but that was too vague for me. So I modified it so that I actually make my to-do list in my calendar, as blocks of time. I also keep a running list of illustration work/client work/personal work/personal life to-do's so that I don't forget anything, but my new calendar to-do list has been revolutionary. I have a better idea of how much I can get done in a day – and actually do it all. It keeps me more accountable for how I spend my work time. I'm working on shutting off by 7pm nowadays, and also only responding to email twice a day. It should also be said that I finally got a new computer after a good long run on my MacbookPro. That laptop went with me through design school, 3 internships, and 3 years of freelance work, and it was worse for the wear. It was like my life was buffering! I finally made the investment to get a desktop set up, and I love my iMac so much I don't know how I did without it. So she must get some props for my newfound productivity. And finally, I'm also working out 3x a week in the evenings. I find that helps release a lot of stress and anxiety, especially at the end of the day. What do you do about your mental fitness? I would love to hear what you've found helpful! I'm excited to share that I've finished another #30for30 days project, where I stick to a subject and make a daily(ish) painting for 30 days, and then sell them on Instagram for a super special low rate of $30. It's a fun way for me to share my work, and reward all of you for supporting my paintings! For the month of June, I decided to take on florals so that I could expand my portfolio of flower and botanical paintings. It nicely coincided with my growing hobby of turning my house into an indoor jungle. More about that later. For the florals, check out my tag #30for30florals on Instagram to see the rest; or see a selection of my favorites in my portfolio. I'm going to take a little break from doing a 30 day series in July as I focus on big, exciting freelance projects (can't wait to share those) and working a ton on my book! Now that we're halfway through the year, I took a little time to reevaluate my January goals/resolutions. I'm happy to see that I've made good progress on checking off half of my resolutions list. Now I'm focusing on health – both physical and mental health. It's been a change for me to really focus on defining work/life balance for myself. But in order to have a sustainable, healthy life, I have to start making changes before I turn into an anxious, gollum-y creature hunched over my Cintiq as a permanent state of being. Ryan and I signed up to go to the gym and work out with a personal trainer 3x a week, and we've already been 4 times in the past week. That's more than any form of exercise I've stuck to in the last...oh, 9 years. I'm also trying to make some changes in my diet, and that part is especially challenging now that I work by myself in my studio. I'm tackling a little change at a time, from drinking 80oz of water daily (I just fill up my tumblr 4x a day), to meal prep for lunch for the week, and now adding in working out! I'll update ya on how it's going as the summer progresses. Any health tips or thoughts appreciated! P.S. I started writing more about mental health balance as well, and then the post started getting so long I decided to split it into a second post. Look out for that on Monday, and have a great long holiday weekend! I've been doing a lot of researching, reading, and writing as part of my work lately, so I wanted to warm up my lettering with a fun little piece this afternoon. "Go to Nature" was advice from one of my teachers in school, for when we felt stuck and uninspired. I'm not a huge go-to-nature kind of person; hiking a few hours or being on the beach is the extent of my comfort in the outdoors. But something has shifted in the wind for me this year, and I've planned a road trip that will take us through Yosemite at the end of summer. I'm ready to marvel at the majesty of all that is wild and free (allergy pills in hand, of course). Please leave a comment for me below if you have any recommendations for places to stop and see on this road trip! There's been an art hashtag (#MeetTheArtist) circling around social media in the past couple months so I thought I'd finally join in about a month too late. It was fun to work on this in between client projects, but hard to pick just two of my animals, Oliver and Bettie, to illustrate here. Don't worry, our kitty Penny will be in Ryan's. Also, narrowing down my likes and dislikes into short, sweet lists was tough. This stands, at least for this week! New Site, New Blog, New New! Welcome to my new blog! After 15 years at annplified.com – yes, fifteen years – I've finally consolidated my blog and my portfolio into one location, here on ann-shen.com. It feels bittersweet to say goodbye to the end of an era – Annplified was my first solo domain, where I taught myself coding and graphic design as a bright eyed and bushy tailed teenager. However, as they say – every new beginning comes from some other beginning's end, so here's to a new beginning! Cheers to all of you who have read my blog all these years, and let's look forward to many more years ahead together. A return to the written word, beyond the apps on your phone. Welcome to the new site – hope you like it and you stay awhile! It's been exactly one year and one month yesterday since we decided to throw a party with our loved ones and declare our dedication to a life together in a way that made us both a little sweaty and a little lock-jawed. It was wonderful. And now the photos and verbose details are on Style Me Pretty for those of you who are interested!